Crystal and gem soaps can be made a wide variety of ways. Techniques include embedding soap, creating layers, and swirling various colors. For these Alpine Frost Crystal Soaps, we kept it simple with one color and plenty of sparkle. The bars are scented with Alpine Frost Fragrance Oil. 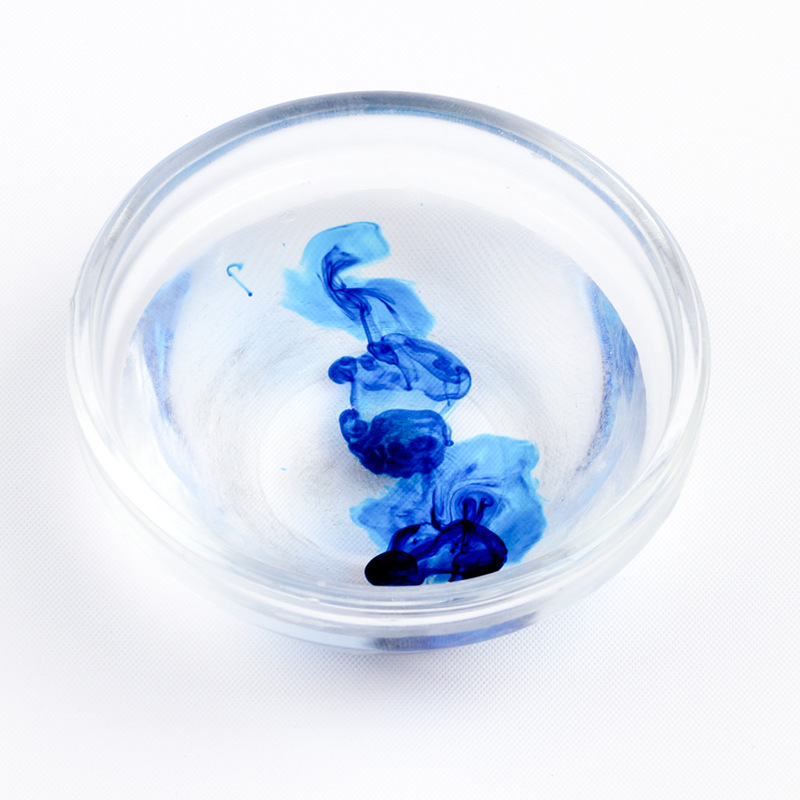 It’s a perfect complement to Brilliant Blue LabColor, which is a concentrated liquid FD&C dye. 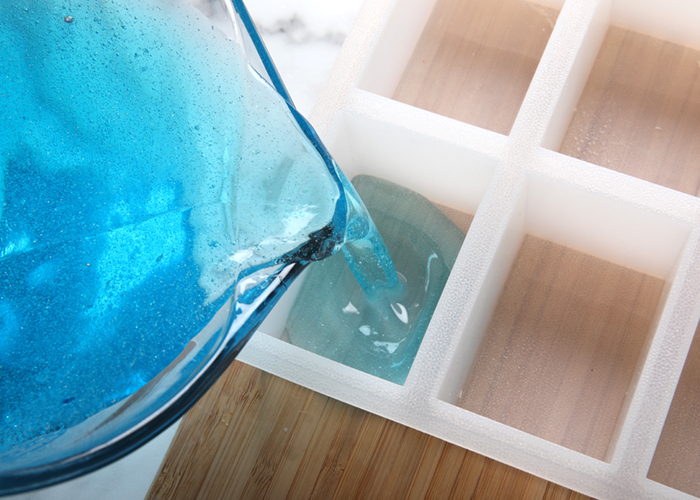 LabColors are great for melt and pour soap gems because they create a transparent look. The color needs to be diluted with distilled water and a preservative before use – learn how here. 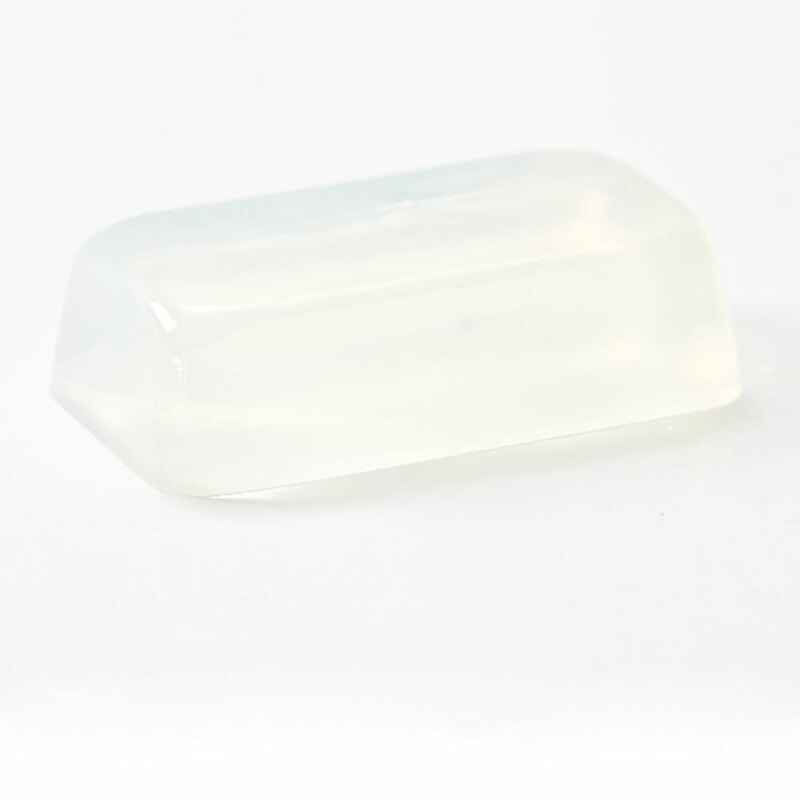 Because this crystal soap is simple, it’s perfect for beginners. It’s a great holiday project for kids and teens – just make sure they’re safe when using the knife. Crystal and gem soaps make great gifts – we love customizing them based on the receiver’s birthstone. These icy blue bars work well for the December birthstone, which is a topaz. 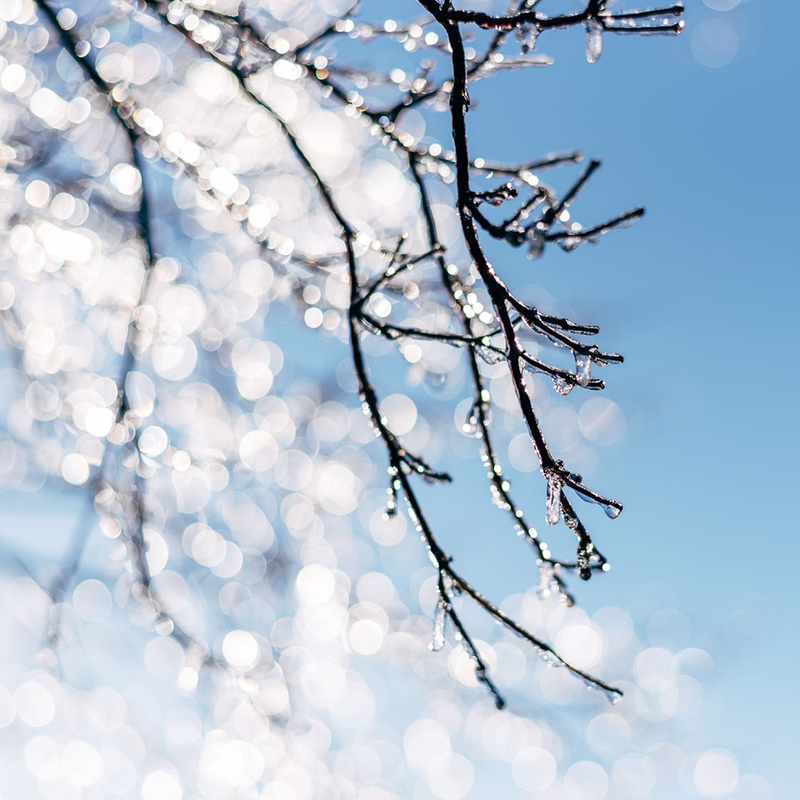 We recommend wrapping the gems tightly in plastic wrap to prevent glycerin dew. If the bars are large, you can place them in individual bags. 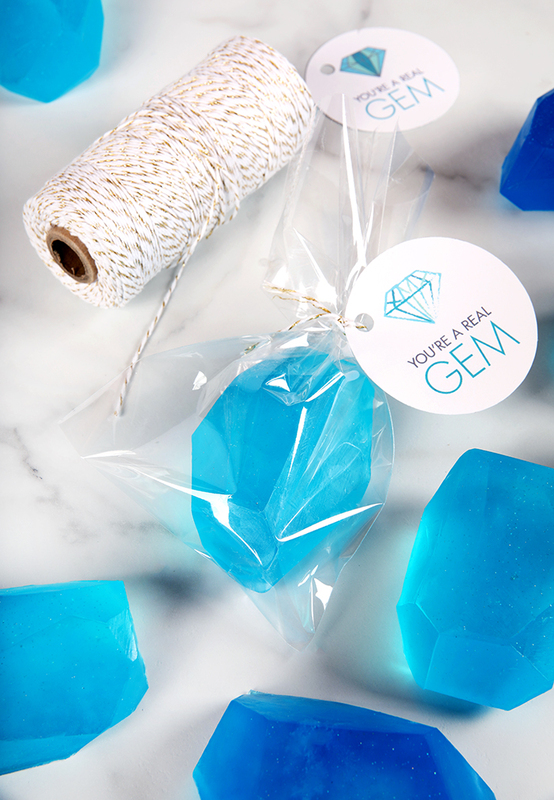 Or, cut them into small gems and place them in a gift box like we did with this Crystal Soap Gift Set. The free printable would be perfect for this project. 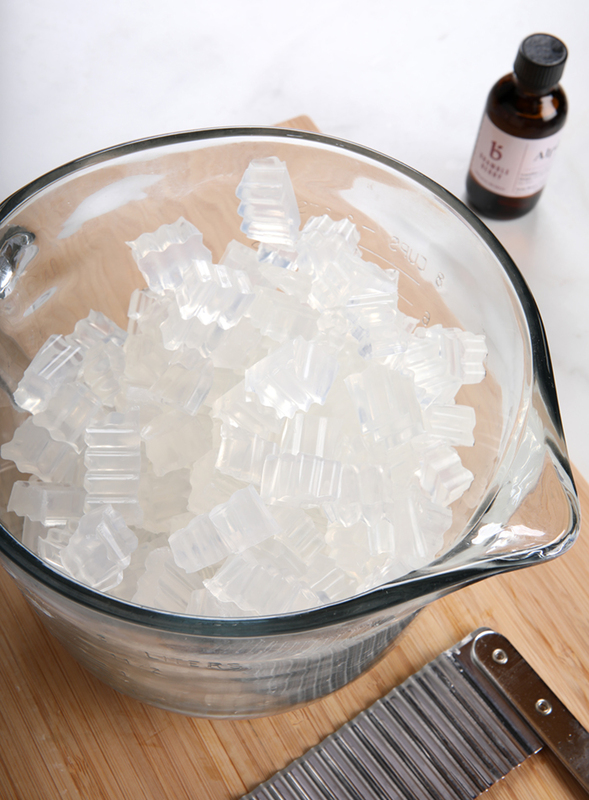 ONE: Chop 32 ounces of Stephenson Ultra Clear Soap Base into small, uniform cubes. 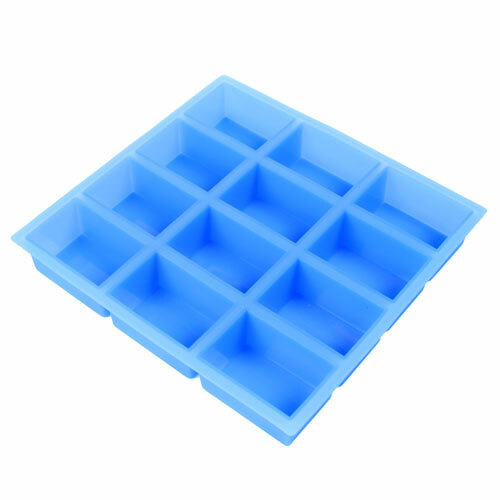 Place them into a large heat-safe container and melt completely using 30 second bursts. Stir in between each burst to help the soap melt evenly. 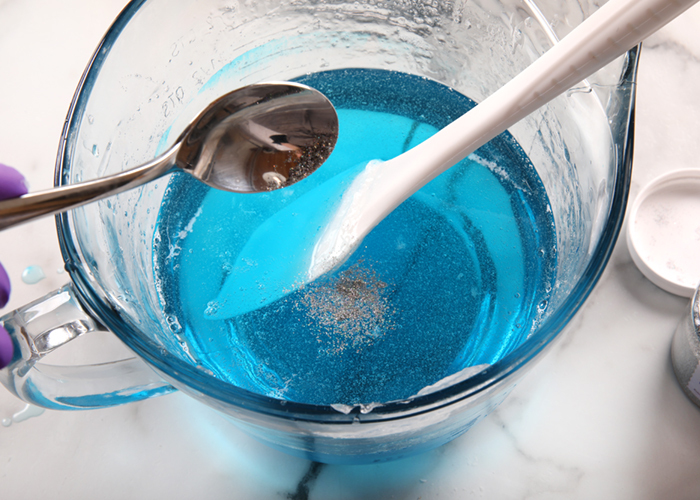 TWO: Add 0.7 ounces of Alpine Frost Fragrance Oil and mix in thoroughly with a large spatula. 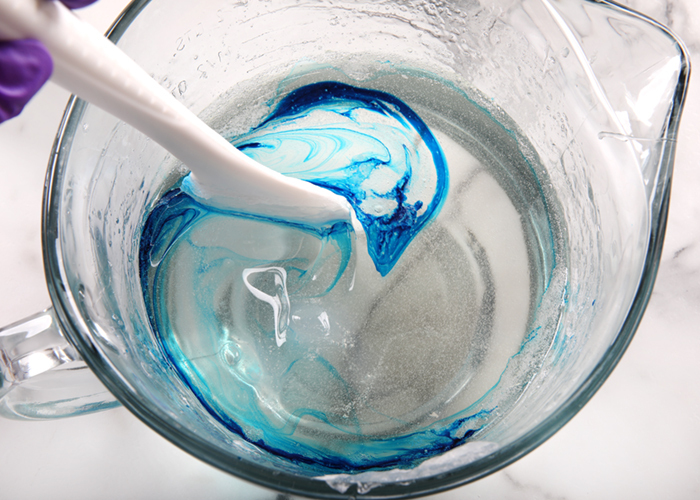 THREE: Add 1 mL of diluted Brilliant Blue LabColor and stir to fully incorporate. You can add more color if you like. Start with a few extra drops and stir until you get a shade you like. NOTE: Click here to learn how to dilute Bramble Berry LabColors. 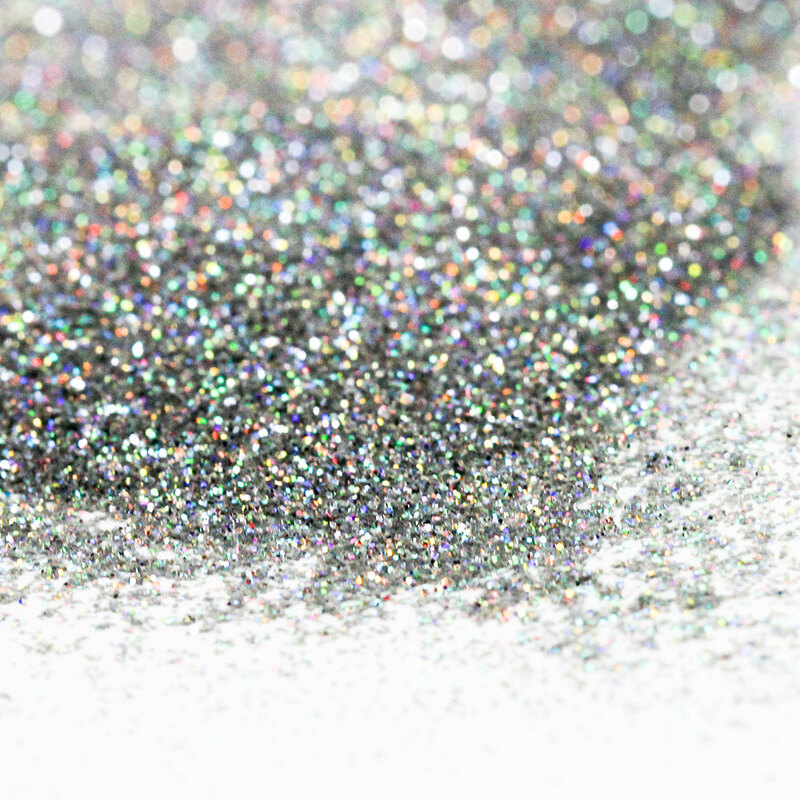 FOUR: Add about 1/16 teaspoon of Fine Silver Rainbow EcoGlitter and stir in thoroughly. Feel free to add more glitter if you like. FIVE: Pour the soap into the 12 Cavity Rectangle Silicone Mold. Spritz with the top with 99% isopropyl alcohol after each pour to help get rid of bubbles. Allow the soap to fully cool and harden for several hours. SIX: Remove the soap from the mold. 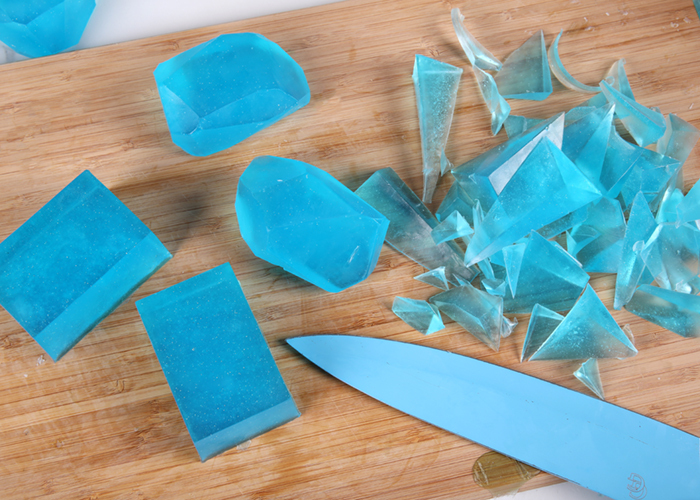 Use a sharp non-serrated knife to cut the bars into gem shapes. There is no right or wrong way to do it – just have fun. SEVEN: Place the scraps back into the heat-safe container and remelt in the microwave using 15-20 second bursts. 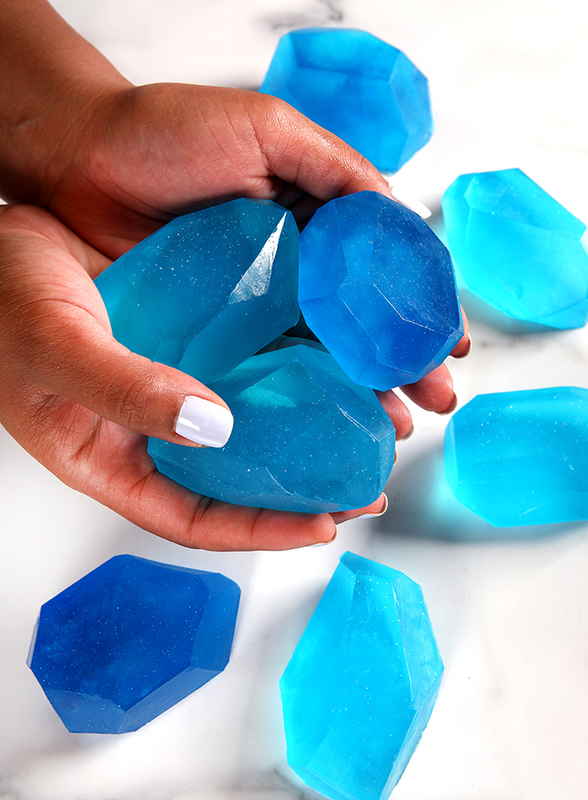 Pour the soap into the mold, allow to harden, and cut into gem shapes. 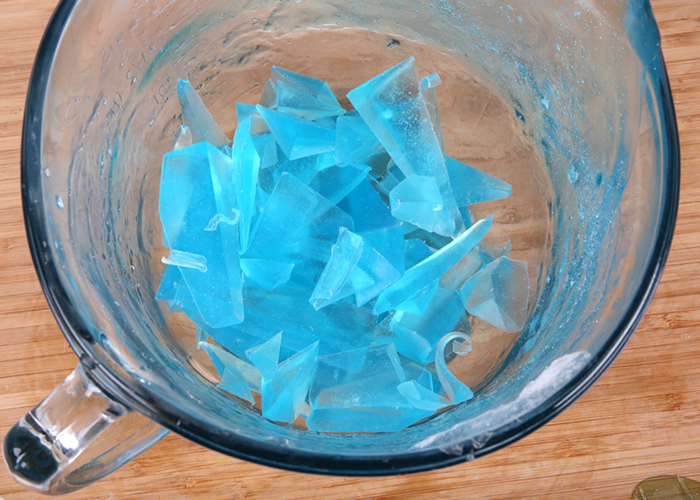 NOTE: Once the second batch of soap was melted, we added a few more drops of the Brilliant Blue LabColor to create the darker gems shown in the photos. EIGHT: To prevent glycerin dew, wrap each soap in plastic wrap. The soaps are ready to use right away. Enjoy. Chop 32 ounces of Stephenson Ultra Clear Soap Base into small, uniform cubes. Place them into a large heat-safe container and melt completely using 30 second bursts. Stir in between each burst to help the soap melt evenly. 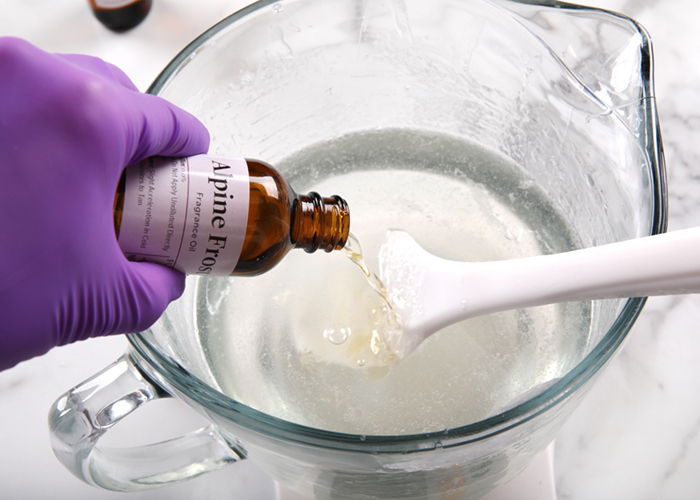 Add 0.7 ounces of Alpine Frost Fragrance Oil and mix in thoroughly with a large spatula. 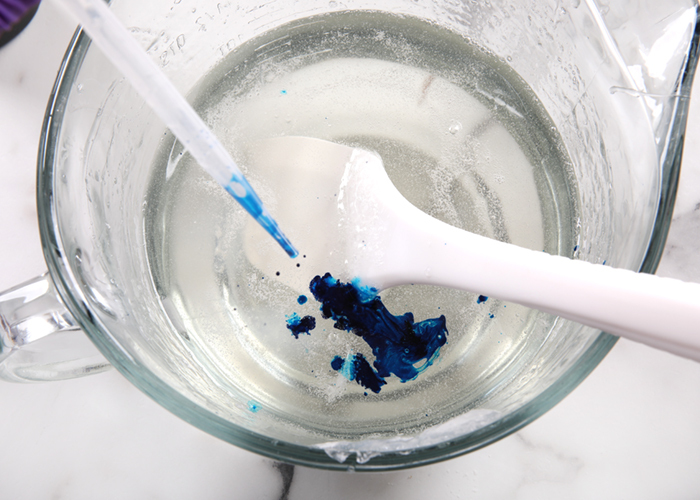 Add 1 mL of diluted Brilliant Blue LabColor and stir to fully incorporate. You can add more color if you like. Start with a few extra drops and stir until you get a shade you like. Add about 1/16 teaspoon of Fine Silver Rainbow EcoGlitter and stir in thoroughly. Feel free to add more glitter if you like. Pour the soap into the 12 Cavity Rectangle Silicone Mold. Spritz with the top with 99% isopropyl alcohol after each pour to help get rid of bubbles. Allow the soap to fully cool and harden for several hours. Remove the soap from the mold. 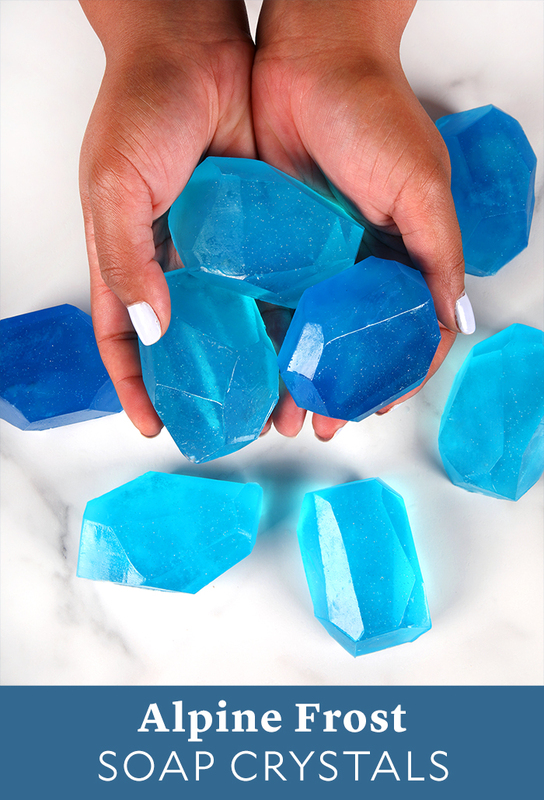 Use a sharp non-serrated knife to cut the bars into gem shapes. There is no right or wrong way to do it – just have fun. Place the scraps back into the heat-safe container and remelt in the microwave using 15-20 second bursts. 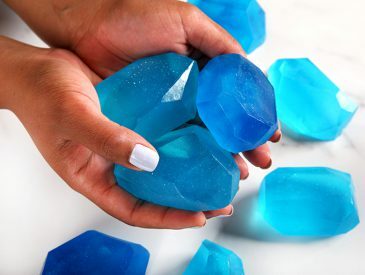 Pour the soap into the mold, allow to harden, and cut into gem shapes. NOTE: Once the second batch of soap was melted, we added a few more drops of the Brilliant Blue LabColor to create the darker gems shown in the photos. To prevent glycerin dew, wrap each soap in plastic wrap. The soaps are ready to use right away. Enjoy.